Da Danilo is an unassuming restaurant that’s farther away from the center than other Roman institutions. From the area (Piazza Vittorio), you would never guess that it’s been around for years and has hosted more than its fair share of celebrities. The trattoria is well known for its Roman classics, serving everything from meat dishes to desserts made in house, but it’s best known for its amazing pasta dishes. 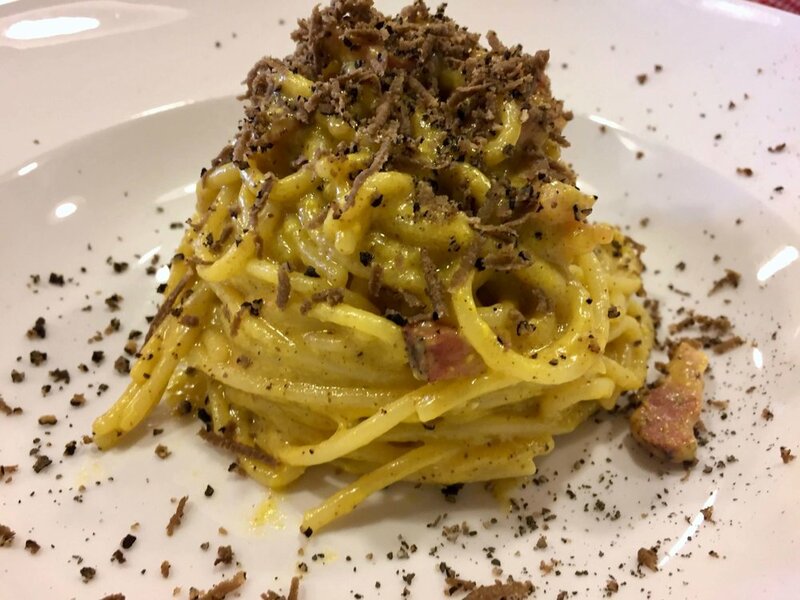 The Carbonara and Cacio e Pepe are famous around Rome and many people come here just for these. The Cacio e Pepe (or "cheese and pepper") is something special because it’s prepared right in front of you by your waiter. The pasta is tossed in a giant wheel of parmesan cheese with a bit of the pasta cooking water, while fresh black pepper is cracked all over. To finish it off, a generous helping of pecorino is grated over top. If you’re hungry and watching this show being done for other diners, it’s pure torture. Carbonara da Danilo is perfectly prepared with balanced flavors and a smooth, creamy consistency. But the standout at this restaurant (and my choice) was the carbonara al tartufo. Truffle oil is mixed in with the sauce and Italian black truffles were grated and sprinkled over top of the pasta. Of the multitudes of carbonaras that I’ve tried in Rome, this is my favorite. Think creamy, eggy goodness with an ever-present undercurrent of rich truffle. If it weren’t €18 for a plate of pasta, I’d go back weekly. If you’re in Rome and want a reputable place to try out the classics, da Danilo is where it’s at. You can eat some of the best pasta of your life, while gazing at the hundreds of celebrities that Danilo and his family has met over the years at the restaurant.